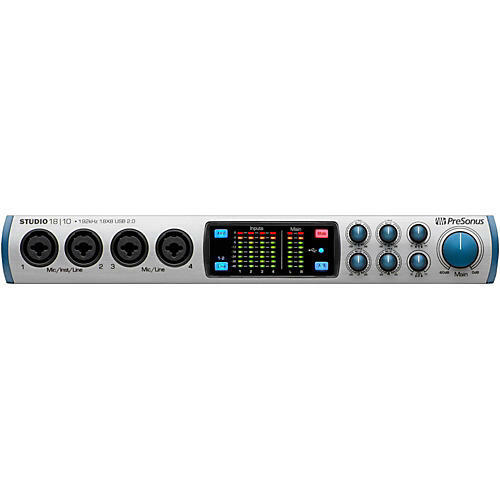 A fine choice for project studios, the Studio 1810 USB 2.0 audio/MIDI interface records at up to 192 kHz and offers flexible routing, near zero latency monitor mixing, and control room integration with included Studio One Artist and UC Surface for Mac, Windows and iPad. Up to 18 inputs and 8 outputs (8x8 at 192 kHz), including four XMAX Class A preamps and eight channels (four channels at 96 kHz) of ADAT Optical inputs; and an 18x8 DSP monitor mixer. In addition to L/R main outputs, you get four balanced line outputs for monitor mixing or speaker switching, two headphone outs with mix sharing, and MIDI and S/PDIF I/O. Studio One Artist ships with the 1810 so you can get started right away.